I enjoy making things for myself. So I have decided to help out those who feel the same way. I have added four new pattern designs to my Etsy Store Front. 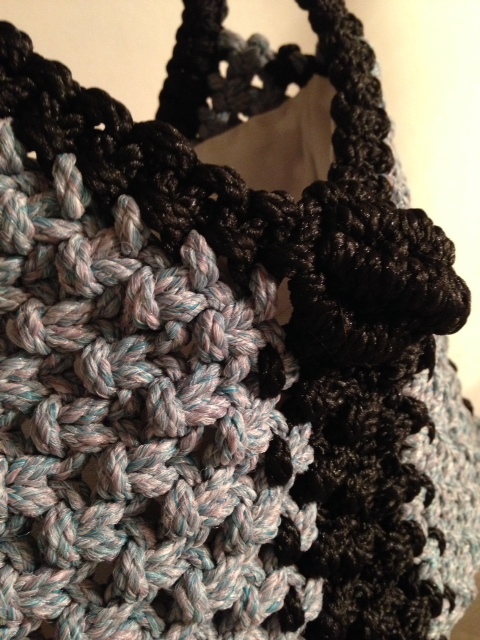 There are two great shoulder purses. These purse designs are the best. Once made, they will last a lifetime. The shoulder straps are worked through the entire purse for durability and strength. Easy to maintain; just toss into the clothes washer and air dry. With macrame cord, the colors do not fade, so it keeps its good looks always. If you are looking for a project to enjoy this summer, then take a peek at the other two pattens added. 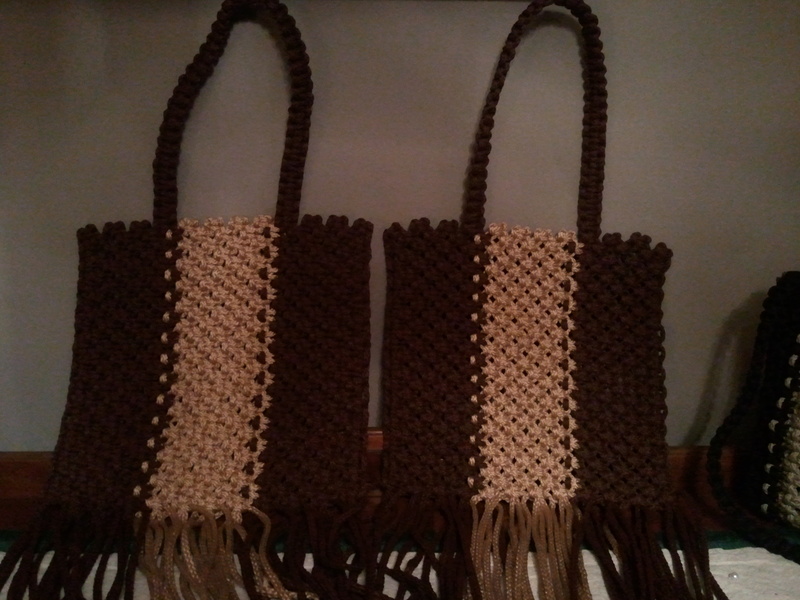 They are two versions of the same hanging macrame chair. One I have made for myself and the other I will be working on soon. I hope one of these patterns will spark a bit of DIY in you. 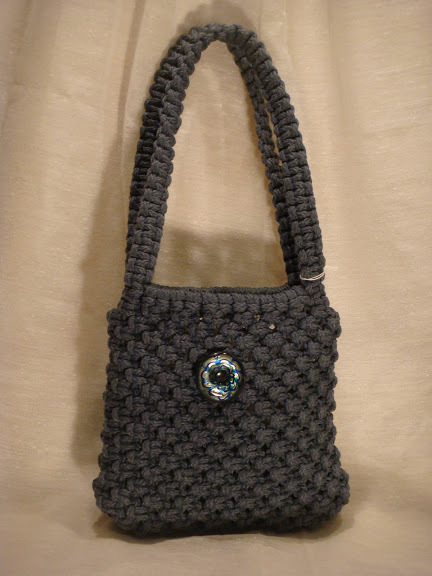 I receive many people requesting a special order purse. I have a form that you should initially fill out to start the process. There are two items on this form that I would like to take a little time to talk about. One is the difference between the cord thicknesses. 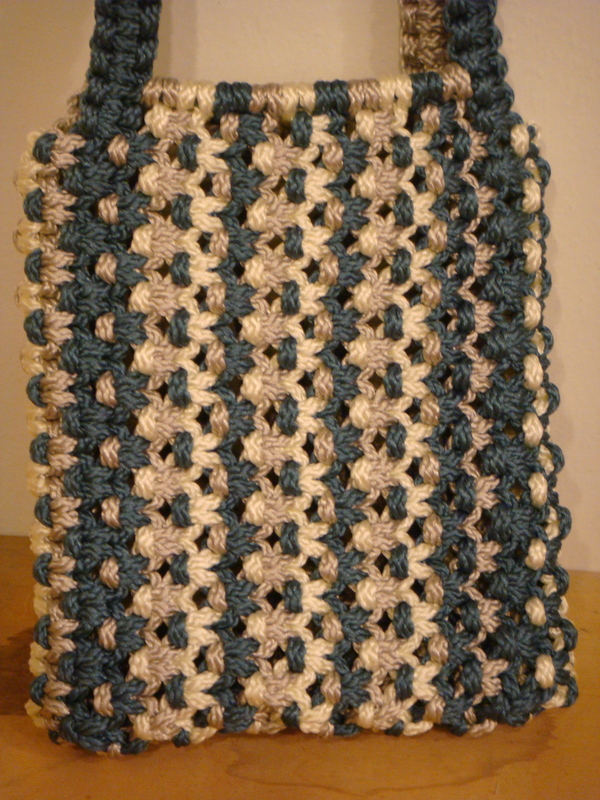 In the case of macrame cord, the higher the number, the thicker the cord. This means that it will take less knots to produce a specific size or if the same number of knots are produced, the item will be bigger than a smaller millimeter cord. The strength and durability is the same but the item has a slightly different texture when you use a smaller cord. The smaller cord allows a tighter and smoother look, but does need a style that will help stabilize a larger item. The larger cord has the same uniformity but has a thicker look to it and has the ability to stand on its own when the item grows in size. 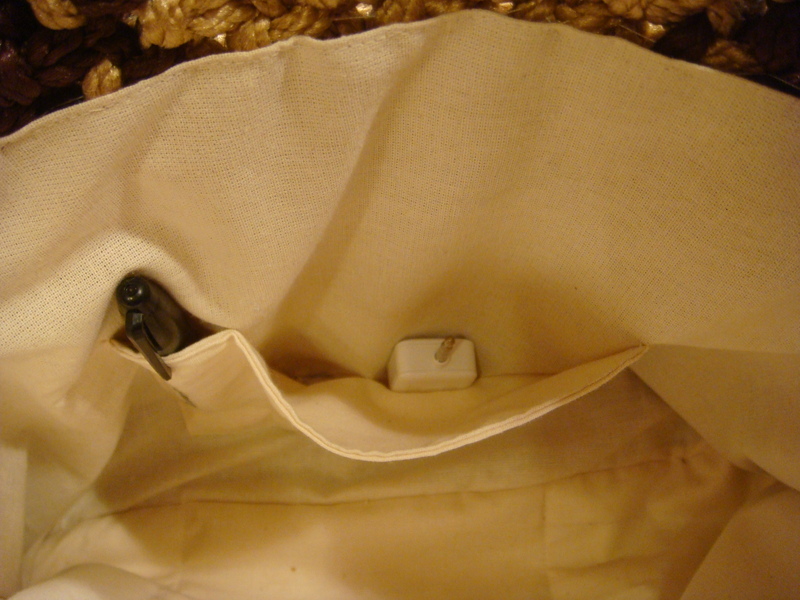 You can take a 6mm cord purse and give it a little push down from the top rim and in most cases the bottom will hold the purse upright without help. The second item I would like to address is the Available Colors on the form. This website has a page labeled as such to give you reference to what colors are still around for me to use. Take a look at this page or click the link toward the top of the Order form before ordering. It is best to give me the exact color name that you prefer. 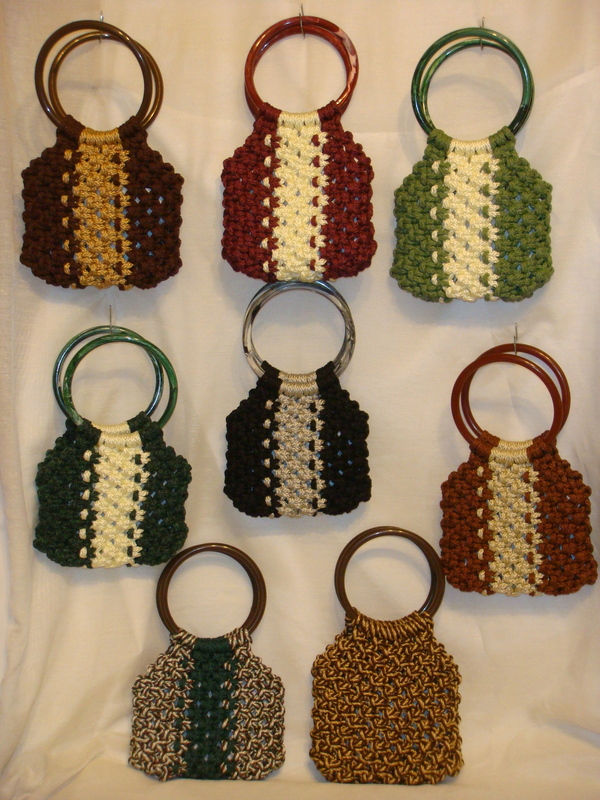 If you are not sure of the color representation, let me know and hopefully I can show you a purse in the Gallery that uses that color for reference. Because these are individually made, I want to ensure that you are happy with the finished piece. I would suggest that you measure your phone and any other item that you would like a special pocket made and enter this information in the last area of the form. One last thought. 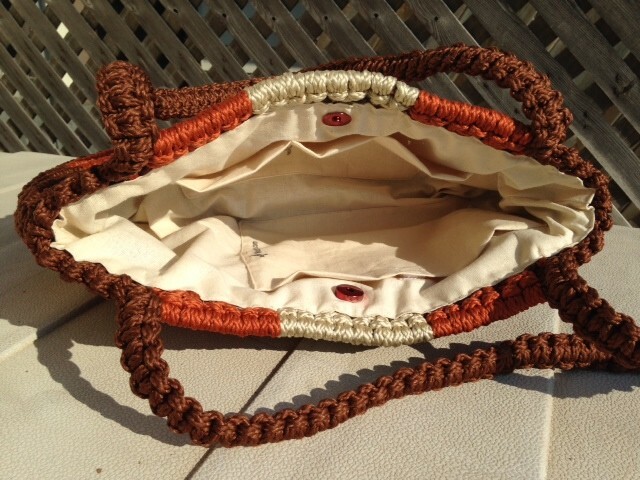 These purses are strong, durable and easy to maintain. I wash my purses in my front loading washer and pull the liner up, setting it outdoors to dry when I can or just in the house during the winter months. They dry in no time. The only difference are the flex frame purses. These should be washed with a towel wrapped around so the frame does not bang into the sides of your washer; wash on delicate. Also remove any glass ornaments before washing like the picture above on the right; they can be reattached after. If you have any questions, please let me know. I will be more than happy to get back to you. 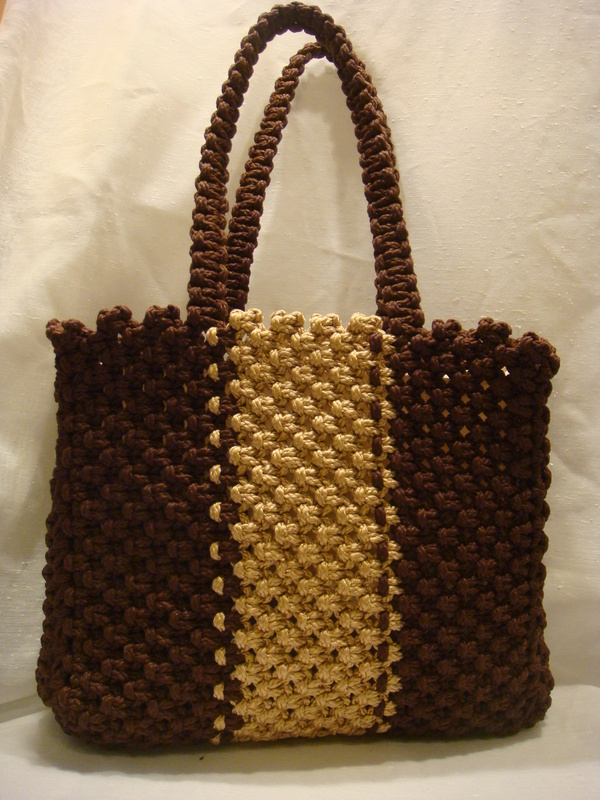 Debbie from South Carolina was my first customer on our new Square Market store front called MacramePurse.com. She purchased the purse on the right. It was included as a stock item on our new store. To my surprise, the purse had already been purchased. I was able to replicate it for her as shown in the picture on the left. It is the same size and features the Berry Knot on the front. The only difference is the liner. 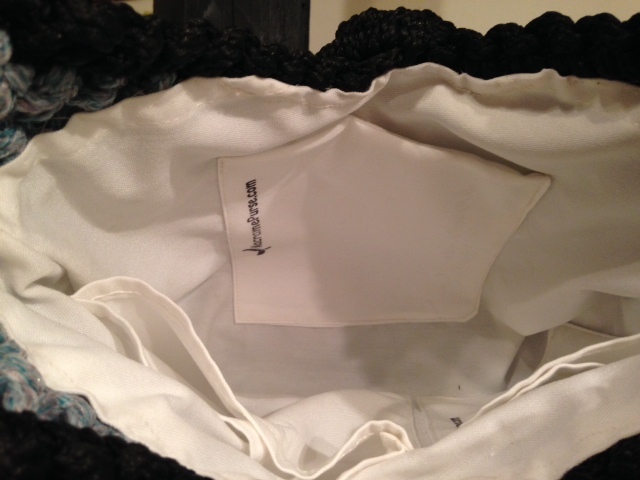 The first purse had a light blue liner with 3 single pockets, where as Debbie’s purse has a white liner with one single pocket and two double pockets. These purses are great for everyday use. 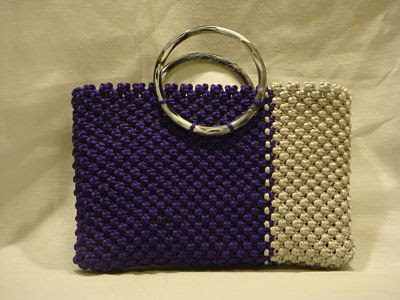 I am currently using a smaller version of the Texas Flare purse style. My color scheme is cactus green, black and white; you can see it in the Gallery. It goes everywhere with me. If I notice that the white has a little something on it or maybe the colors look a little dusty, I toss it into my wash machine, let it air dry with the liner pulled up a bit; it will look like new. 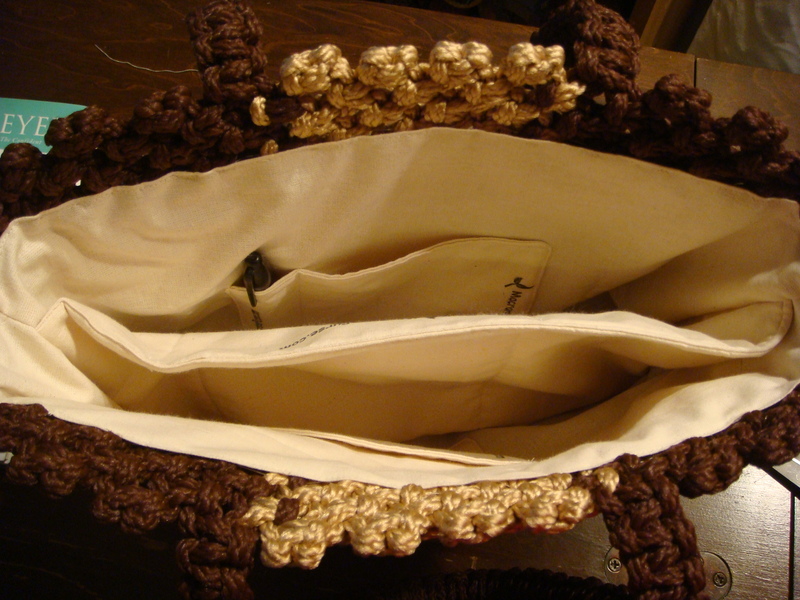 Thank you again Debbie for allowing me to make you a MacramePurse. 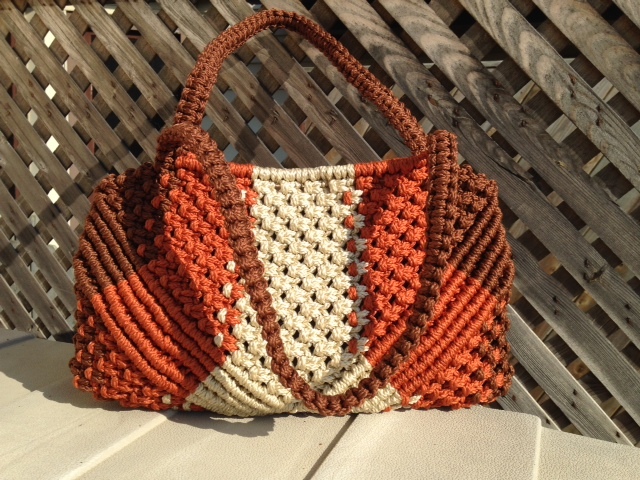 Jessica from Grapevine Texas contacted me to make this purse for her. It is a little bit different from a black, white and green version you can see on our Gallery page. 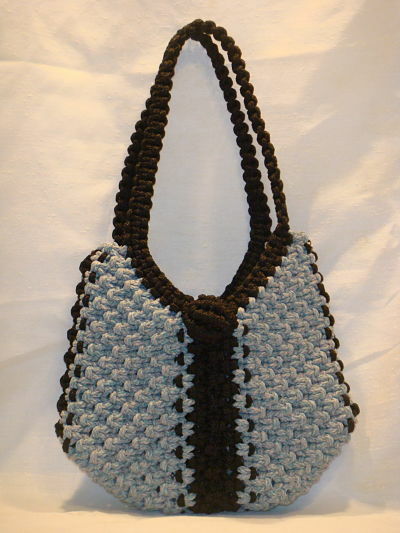 This purse uses rust, pearl and almond colored cord; it is fully washable and very durable. It measures 14″ x 9.5″ with 11″ straps. I hope she enjoys this purse for many years to come. What three colors would you choose for this pattern? 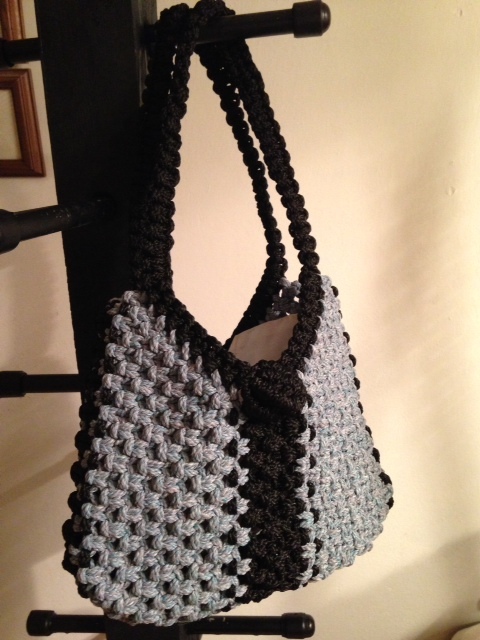 Teal, silver and ivory alternating cords make up this fun purse. 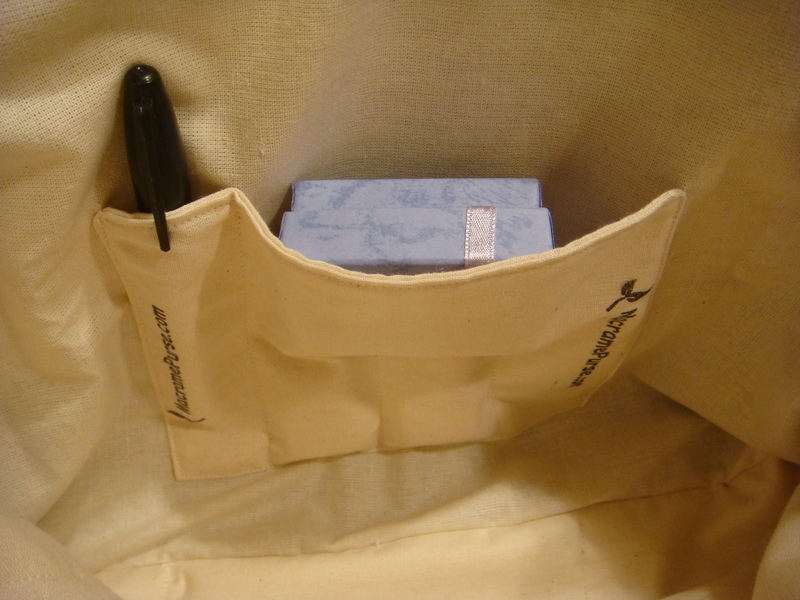 The strap measures 21″ from shoulder to the top of the purse opening. I will line it with a white fabric, having a pocket on each side. The body measures 7.5″ wide and 8.5″ long; large enough to accommodate a phone, Kindle, keys and small wallet.